Tonight, my entire meal could have fit in a tea cup. In this case, size doesn’t matter because this was a full meal, even if the whole thing was encapsulated in a bell pepper. In addition to looking adorable (before it was destroyed), it was incredibly tasty. 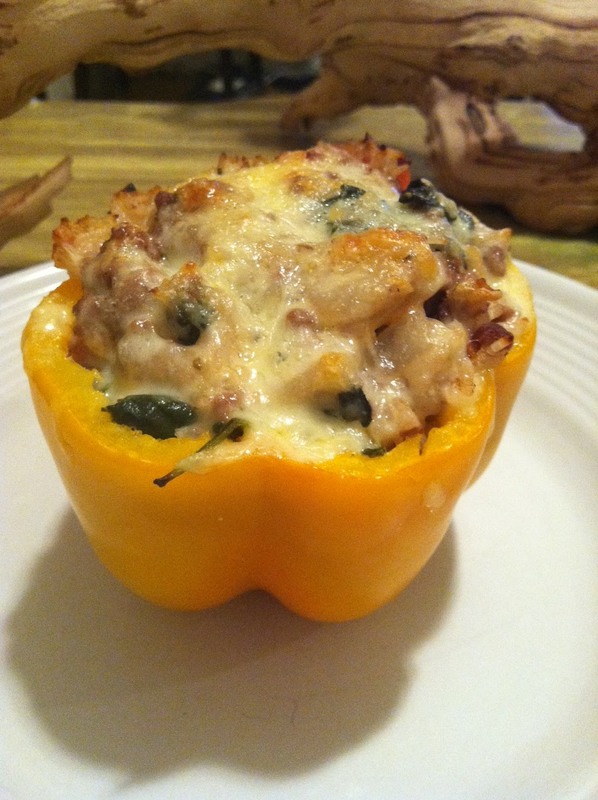 Not sure how to make stuffed peppers? Don’t worry, it doesn’t require a real recipe. Over the weekend, I grabbed whatever ingredients looked appealing at the grocery store and tonight I threw them into a pan in random quantities. Basically, it’s pretty tough to screw up. If you’re still concerned, feel free to do what I did. Though, like I said, I didn’t measure anything out, I can at least tell you what ingredients I used because I have a feeling you’ll like the flavors. While the rice was cooking, I started sauteing onions. Once those had softened, I added ground buffalo meat to the pan and browned it. Once the meat was mostly cooked through, I added garlic, diced tomatoes, and fresh spinach. When the spinach had wilted, I seasoned the mixture with dried oregano, salt, and pepper. In a lucky culinary moment, the rice finished cooking right when everything else did. 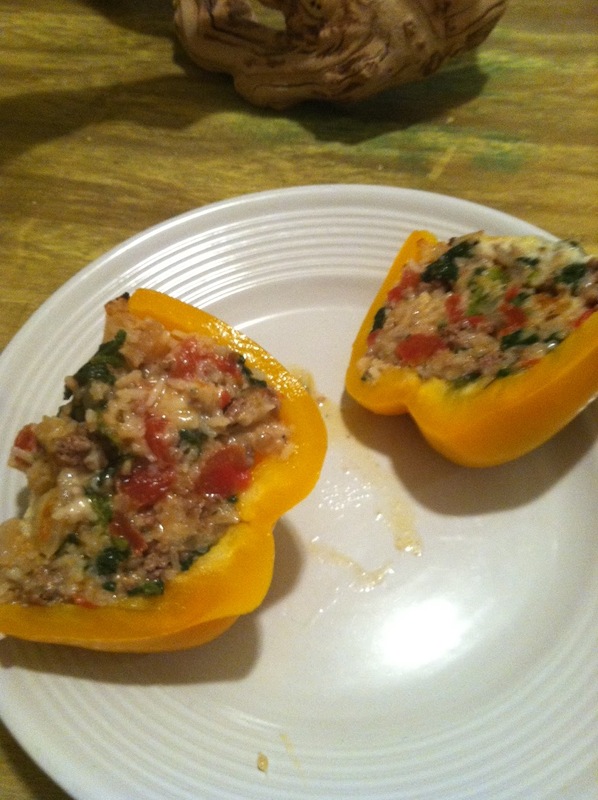 I mixed in the rice and grated fontina cheese and packed it into a hollowed out bell pepper. A little extra fontina on the top is a must so you get that desired crust. Everything is already cooked so stick it in the oven at 375 for about 20 minutes or just long enough for that fontina to get browned and bubbly. I’ll be honest, I threw these ingredients together sort of willy nilly, but I am happy to say they worked. Buffalo meat is leaner than ground beef, cost efficient, and tastes wonderful – a little sweeter than beef. In this case, I think it was a better choice than beef – a nice little surprise. And who doesn’t love a full meal in a perfect little package like this? It’s sort of like Willy Wonka’s 3-course dinner chewing gum only it won’t turn you into a giant blueberry, which means you’ll still be in the running to win the entire chocolate factory.